Would you imagine my 83-year old Grammy could walk 10 miles in her well-worn-in Keds? Would you guess that my cousin Cathy would learn some Basque words in her lifetime? 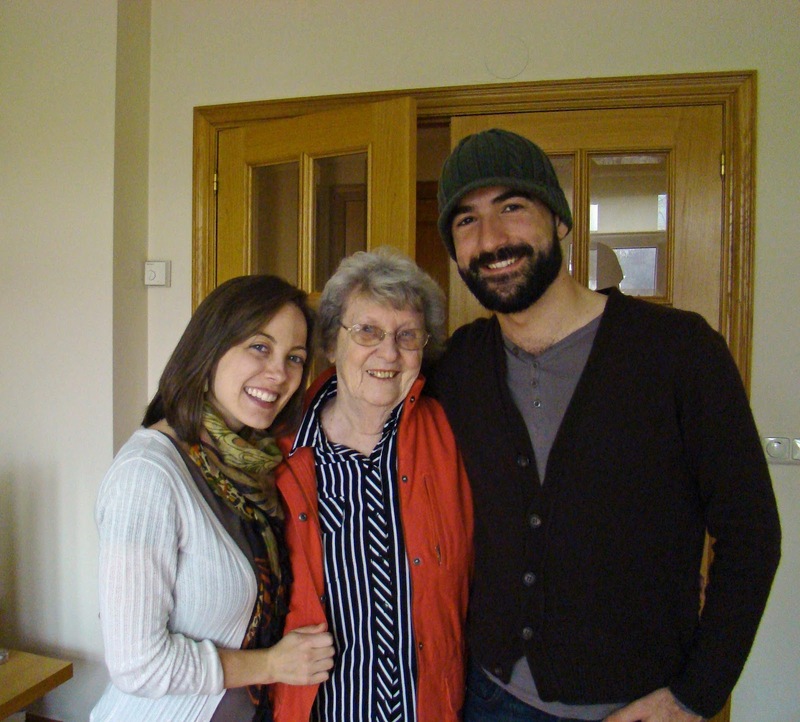 Can you imagine 3 generations of family, new and old, joining together and speaking 3 languages over lunch? It may sound like something out of a great movie, but really it's what just happened over the last week when Cathy and Grammy paid us a visit in our lovely little town. Cathy had already been the previous year with her husband Paul, and was delighted to be able to visit again. 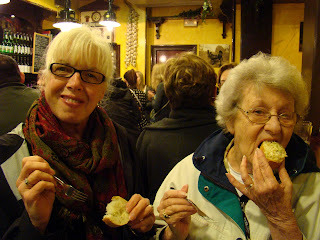 As for Grammy the combo of meeting my husband, getting to know his family and our friends along with checking out our city was a lot! With something exciting every day, the smiles never were wiped off thier faces (mine either) and from one activity to the other, pintxo after pintxo and wine after wine, they kept thier contagious happy attitudes up and made every moment priceless. Waiting at the airport, I was unusually patient at the start, but then as time passed I started twiddling my thumbs, and after a bit of antsyness they emerged from the luggage area - two little white-haired ladies gazing around looking for us. I recognized them in an instant and grabbed Joseba's hand and shuffled over as fast as I could without making a scene and hugged them both! Shocking for me, there were barely any tears! In the car ride home, they were chatty about how thier flights had went, the food, thier landing into Bilbao and the trip so far! As we whizzed down the freeway they also were able to admire the rolling green hills along the way, puncuated by traditional farm houses and sometimes even sheep grazing. While half a world away, they both remarked that it looked like it could be out of WA or OR! And it's true! Even after 4 years, I still the Basque countryside is gorgeous and I was happy to have other people see it through my American eyes for once. As Cathy saw the Jesus statue atop Mount Urgull from the freeway, she knew we were getting close to Donostia and in a jiffy we were pulling up to thier apartment they had rented for the week. Two bedrooms, two baths, a cute kitchen and a living room with a lovely bay-style window that overlooked the park across the street and the river that runs through town, it was a superb place to spend a vacay! We let them spruce themselves up and met back up for the first of many pintxo stops on the trip. The first thing Grammy remarked on after coming out of the parking garage were the tulips - in full bloom and gorgeous as ever. The whole city is landscaped beautifully - a heaven for my green thumb cousin and Grammy! I heard more names of flowers in 5 minutes than I probably had in 3 years! It's silly though, but little details like that made it seem more real that they were HERE, which is really something I had always dreamed about but wasn't sure would ever come to fruition. Here was my Grammy listing off all the flowers in the little garden in English next to my Basque husband and me in San Sebastian! It was unreal. The first pintxo of the trip was my oh-so-favorite one - a risotto made with the traditional Basque sheep cheese (Idiazabal). I have yet to find anyone who doesn't love it with their entire soul, so it's always on my list of must-eats. It went over real big and they were hungry for more, so we went to the next bar based on Grammy's request. 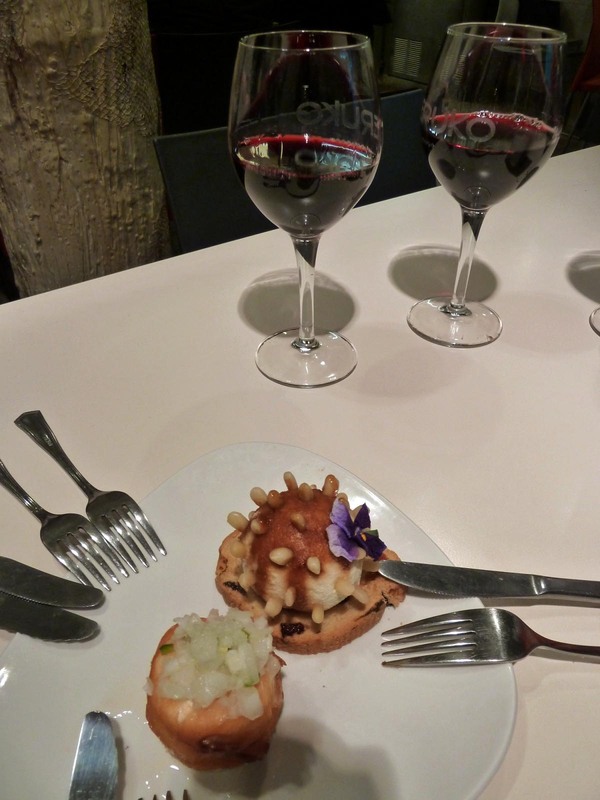 A few weeks ago, I wrote a blog about having gone to a pintxo bar called Zeruko and there, Joseba ate a pintxo that had a real flower on it. Grammy just had to have one! This little lady who loves pansies just had to taste one! 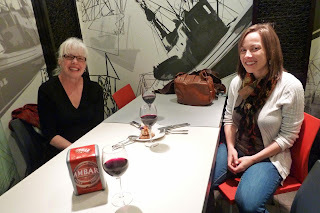 With a few more pintxos on the table (one that even had hot coals that cooked our hake fish right in front of our eyes), our bellies were becoming happier and happier. Our last stop of the night was a very Basquey bar that Joseba and I frequent. Normally packed, it was empty enough we could set our bags down and really enjoy the 3 types of spanish omellete we picked out. One with just potatoes, the traditional style; one with a middle layer of melted cheese and ham; and the last one - a crazy combo of chorizo (a type of sausage), spinach, homemade milk mayonaisse (never even heard of that) and cheese! You can obviously imagine each pintxo we had that evening was accompanied by a delicious wine - red from the Rioja region and white from a small fishing village called Getaria. After over 20 hours of travel time and a mouth-stuffing good time in the Old Part, the trip was off to a good start! And as they left, I thought of a quote that seemed to fit the situation perfectly - 'Like branches on a tree, our lives may grow in different directions yet our roots remain as one.' - author unknown. Me here and them there, it doesn't matter - we are still family.